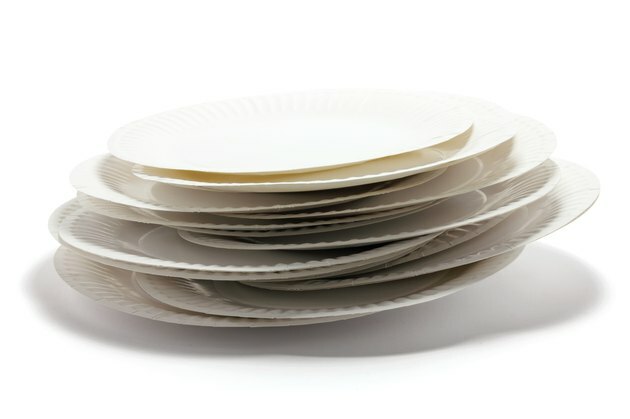 The use of paper plates during picnics or big parties where washing and avoiding breakage of ceramic plates would be inconvenient may raise the question: what is the environmental impact of using paper plates? Determining whether using paper plates is better for the environment than running a dishwasher load that consumes electricity and water is a difficult task. However, looking at the impact of manufacturing paper plates as a separate question has clear answers. An investigative story--part of the Secret Life series--on the papermaking process examines the effects of the paper products industry on forests. Though sustainable forest management practices are increasing, much of the pulp used for paper including paper plates depends on virgin wood-based fibers. Being aware of where wood fiber for products is sourced from is becoming easier, as paper product brands now will have indicators if they were created from recycled fibers or fibers from sustainably managed forests. Look for brands using "post-consumer waste" to support recycling methods that most benefit forests, or consider switching to biodegradable compostable sugar cane plates. The Secret Life piece also examines the way unsustainable forestry practices can destroy ecosystems that rely on complex interactions between multiple species; elimination of an entire generation of a species of tree in one area can have a negative domino effect on other species that formerly relied on the logged trees for shelter, food, or conditions needed for reproduction. Logging roads can break up habitats and change wildlife access to food and shelter. As noted by the Sierra Club, "timber production does not harm only trees. A total of "3,000 species of fish and wildlife and 10,000 plant species, including some 300 endangered plant and animal species, live in National Forests" in the United States that are open for logging. To make bright white paper plates, pulp derived from wood fibers must be bleached. Chlorine compounds are ranked among the most hazardous industrial chemicals in large volume use; they are known cancer-causing agents, and also are suspected of causing developmental, reproductive, and immune system damage in living organisms including humans, according to the Secret Life piece. To produce paper products, the environment is at risk, despite improvements to comply with requirements of the Environmental Protection Agency. Keep in mind that unlike office paper and newsprint, because paper plates are contaminated with food residue when used they cannot be recycled. Unless you have a home composting system your paper plates go straight to landfills, where biodegrading processes are slow. An analysis of the impact of paper plates carried out by Grist green news magazine columnist Umbra Fisk points out that ceramic plates are an obvious alternative to paper plates. Though more energy and resources are required to make a ceramic plate, a ceramic plate’s lifetime is likely quite long, balancing out these initial environmental costs. Recycled paper plates are another alternative that will lessen your environmental footprint, or consider buying washable plasticware that is lightweight and easy to take to a picnic and save again for your next outing. How Much of the World's Clothing Is Made From Cotton?